Gone are the days when employees would retire from the same company they joined as young trainees. Today, changing a job is a very common phenomenon. Though it helps people progress in their career, it also brings in some difficulties. Each time you join a new organisation, you are allotted a new EPF member id. People often end up with multiple EPF member ids from different employers. Consolidating all EPF accounts, thus, becomes cumbersome. However, EPFO has now brought in several changes to ease the process. The most significant change is the online activation and management of your Universal Account Number (UAN). UAN is a 12-digit number, which remains the same throughout your employment. No matter how many employers you change, this unique number helps you keep track of all your EPF accounts. The online facility provided by the EPFO to manage your UAN allows you to check you provident fund balance, make claims and transfer request. When you join a new organisation, you just need to provide your UAN. 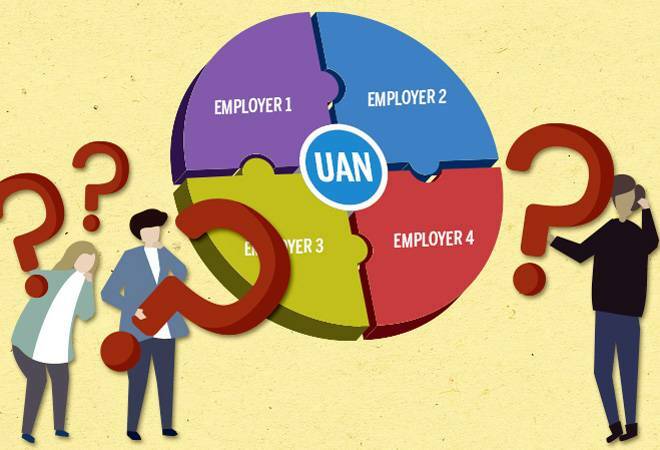 All the EPF member ids, provided by different employers, is linked to your one single UAN. It also allows you to keep a track of your contribution through e-passbook. You also get regular alert on your registered mobile number. However, to access this online facility you need to get your UAN activated and KYC verified. If you do this, your dependence on your employer to process your transfer and withdrawal claims will reduce. How to obtain your UAN? At the bottom right of the page, you will find 'Know Your UAN status' link under the 'Important Link' tab. Once you click on it, you get redirected to a page that will ask you to fill your details. You need to have an EPF member id or linked Aadhaar or PAN number to check the status. Besides any of these mandatory unique numbers, you will also need to fill in the details like name, date of birth, mobile number, email id and captcha. Once you fill in all the details, it asks for an OTP, which is sent on your mobile, and once validated, your UAN is sent to your registered mobile number. You can also use this to check the status if you have applied for UAN activation. At the bottom right of the page you will find 'Activate UAN' link under the 'Important Link' tab. There are various ways through which you can activate your UAN on this page. You need to put in your UAN and fill in your name, date of birth, mobile number, email id, and captcha. If you do not have your UAN, you can still activate your UAN either with Aadhar or with your PAN. Once you fill in all the details, it asks you for an OTP which is sent to your mobile and once it is validated, your UAN is activated. If you are an EPF member, it is mandatory for you to seed your Aadhaar against activated UAN if you wish to make the online claim submission. If you have authenticated Aadhaar and got your bank details seeded against your UAN, you can submit your PF withdrawal/settlement/transfer claims online. The online access also allows you to make changes in your bank account and contact details. You can use only one mobile number for one UAN registration. You can also view the e-passbooks of the EPF accounts, which have been tagged with UAN. These services from EPFO against the UAN are now available on the UMANG (Unified Mobile APP for New Governance). You can download the UMANG APP by giving a missed call on 9718397183.You can also download this app from UMANG website or from the play/app stores. All the other versions of EPF mobile services are now discontinued and this facility is available only through UMANG.